Choy Li Fut is well known for its many weapons sets. Having both Northern and Southern Chinese influences gives Choy Li Fut a wide variety of weapons in its arsenal. Originally, there were 40 weapons in the system of Choy Li Fut. After many years of teaching, some past masters added different implements and other weapons into the system. Today, we have 53 weapons in the Plum Blossom International Federation. Virtually every conceivable Kung Fu weapon is taught to students of Choy Li Fut. 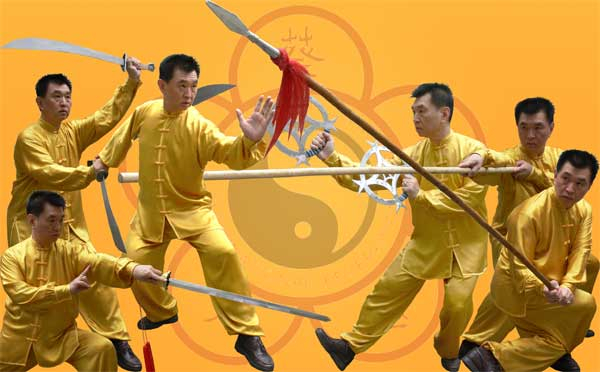 Along with the many single, double, long, short, bladed, and multi-section weapons Choy Li Fut contains many two and three person weapon vs. weapon and empty-hand vs. weapon sets including the Two-Man Staff Set, Broadsword vs. Spear, Double Broadswords vs. Horse Bench, 3-Section Staff vs. Spear, Spear vs. Kwan Do and Empty Hands vs. Double Daggers. One weapon that is exclusive to Choy Li Fut is the Nine Dragon trident created by the Founder Chan Heung. This weapon was designed to shred any part of the opponent with which it might come into contact. The many hooks and blades can seize an opponent's weapon and, with one twist, rip it from his hands. The Nine-Dragon trident is known as the "King" of all weapons. training with multiple weapons helps to make Choy Li Fut students some of the most powerful and well-rounded Chinese Martial Artists in the world.